The Royal Arms of England are the armorials (or coat of arms) first adopted in a fixed form at the start of the age of heraldry (circa 1200) as personal arms by the Plantagenet kings who ruled England from 1154. In the popular mind they have come to symbolise the nation of England, although according to heraldic usage nations do not bear arms, only persons and corporations do. The blazon of the Arms of Plantagenet is: Gules, three lions passant guardant in pale or armed and langued azure, signifying three identical gold lions (also known as leopards) with blue tongues and claws, walking past but facing the observer, arranged in a column on a red background. Although the tincture azure of tongue and claws is not cited in many blazons, they are historically a distinguishing feature of the Arms of England. This coat, designed in the High Middle Ages, has been variously combined with those of the Kings of France, Scotland, A symbol of Ireland, Nassau and Hanover, according to dynastic and other political changes occurring in England, but has not altered since it took a fixed form in the reign of King Richard I (1189–1199), the second Plantagenet king. Royal emblems depicting lions were first used by the Norman dynasty, later a formal and consistent English heraldry system emerged at the end of the 12th century. The earliest surviving representation of an escutcheon, or shield, displaying three lions is that on the Great Seal of King Richard I (1189-1199), which initially displayed one or two lions rampant, but in 1198 was permanently altered to depict three lions passant, perhaps representing Richard I's principal three positions as King of the English, Duke of the Normans, and Duke of the Aquitaines. In 1340, King Edward III of England laid claim to the throne of France, and thus adopted the Royal arms of France which he quartered with his paternal arms, the Royal Arms of England. Significantly he placed the French arms in the 1st and 4th quarters of greatest honour, signifying the feudal superiority of France over England (The King of France was the feudal overlord of the Duke of Aquitaine). This quartering was adjusted, abandoned and restored intermittently throughout the Middle Ages as the relationship between England and France changed. When the French king altered his arms from semée of fleur-de-lys, to only three, the English quartering eventually followed suit. After the Union of the Crowns in 1603, when the Kingdom of England and the Kingdom of Scotland entered a personal union, the arms of England and Scotland were marshalled (combined) in what has now become the Royal coat of arms of the United Kingdom. It appears in a similar capacity to represent England in the Arms of Canada and on the Queen's Personal Canadian Flag. The coat of three lions continues to represent England on several coins of the pound sterling, forms the basis of several emblems of English national sports teams (although with altered tinctures) and endures as one of the most recognisable national symbols of England. The three lions passants guardants or attributed to William I and his Plantagenet successors (Henry I, Stephen, Henry II, John, Henry III) by Matthew Paris in Historia Anglorum and Chronica Majora in the 1250s. 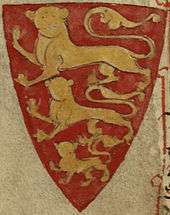 Lions had previously been used by the Norman dynasty as royal emblems, and Attributed arms have been invented for kings who pre-dated the systematisation of hereditary English heraldry that occurred in the second half of the 12th century. 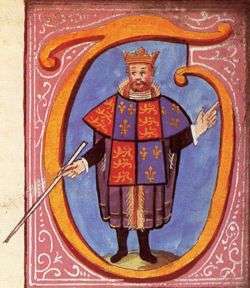 King Henry II of England (1133–1189) had used a coat with a lion on it; his children experimented with different combinations of lions. 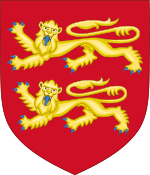 King Richard I (1189–1199) used a single lion rampant, or perhaps two lions affrontés, on his first seal, but later used three lions passant in his 1198 Great Seal of England, and thus established the lasting design of the Royal Arms of England. Although King John (1199–1216) had a seal in 1177, with two lions passant guardant, the three lions passant or on a field gules were used as the Royal Arms (or King's Arms) by Kings John (1199–1216), Henry III (1216–1272), Edward I (1272–1307), and Edward II (1307–1327). In 1340, following the death of King Charles IV of France, Edward III asserted a claim to the French throne through his mother Isabella of France. 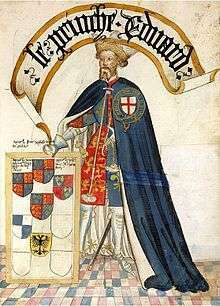 In addition to initiating the Hundred Years' War, Edward III expressed his claim in heraldic form by quartering the royal arms of England with the Arms of France. This quartering continued until 1801, with intervals in 1360–1369 and 1420–1422. Following the death of Queen Elizabeth I of England in 1603, the throne of England was inherited by the Scottish House of Stuart, resulting in the Union of the Crowns: the Kingdom of England and Kingdom of Scotland were united in a personal union under King James VI and I. As a consequence, the Royal Arms of England and Scotland were combined in the king's new personal arms. 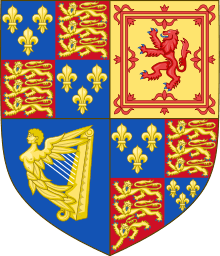 Nevertheless, although referencing the personal union with Scotland and Ireland, the Royal Arms of England remained distinct from the Royal Arms of Scotland, until the two realms were joined in a political union in 1707, leading to a unified Royal coat of arms of the United Kingdom. 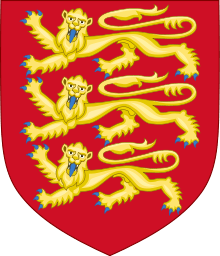 1066–1154 William the Conqueror is said to have brought two golden lions passant, the symbol of the Duchy of Normandy, to England, following the Norman Conquest. 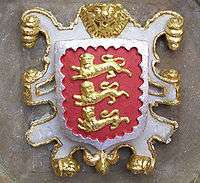 The blazon of the attributed arms of William I, William II and Henry I is "Gules, two lions passant guardant in pale or". 1189–1198 The arms of Richard I of England (Richard the Lionheart) are only known from two armorial seals, and hence the tinctures can not be determined. His First Great Seal showed one lion on half of the shield. It is debated whether this was meant to represent two lions combatant or a single lion, and if the latter, whether the direction in which the lion is facing is relevant or simply an artistic liberty. A simple lion rampant is most likely. 1360–1369 The arms on the second Great Seal of King Richard the Lionheart, used by his successors until 1340: Gules, three lions passant guardant in pale or (Three golden lions on a red field, representing the ruler of the Kingdom of England, Duchy of Normandy and the Duchy of Aquitaine). 1399–1406 King Edward III adopted the Royal Arms of France Azure semé of fleurs de lys or (powdering of fleurs-de-lis on a blue field) and quartered the Royal Arms of England – representing his claim to the French throne. 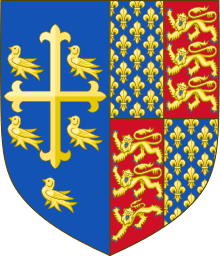 1395–1399 King Richard II impaled the Royal Arms of England with the attributed arms of King Edward the Confessor. 1406–1422 King Henry IV, imitating Charles VI of France, reduced the fleurs-de-lis to three. 1470–1471 King Henry VI impaled the French and English arms, symbolising the dual monarchy of England and France. 1554–1558 Queen Mary I and King Philip impaled their arms. Philip's arms were: A. Arms quarterly Castile and Leon, B. per pale Aragon and Aragon-Sicily, the whole enté en point Granada; in base quarterly Austria, Burgundy ancient, Burgundy modern and Brabant, with an escutcheon (in the nombril point) per pale Flanders and Tyrol. Although Queen Mary I's father, King Henry VIII, assumed the title of King of Ireland and this was further conferred upon King Philip, the arms were not altered to feature the Kingdom of Ireland. Wikimedia Commons has media related to Coats of arms of King James I of Great Britain. Wikimedia Commons has media related to Coats of arms of King James II of Great Britain. James VI, King of Scots, inherited the English and Irish thrones in 1603 in the Union of the Crowns, and quartered the Royal Arms of England with those of Scotland. The Royal Arms of Ireland was added to represent the Kingdom of Ireland. Last used by Queen Anne, this was the final version of the Royal Arms of England before being subsumed into the Royal Arms of Great Britain. 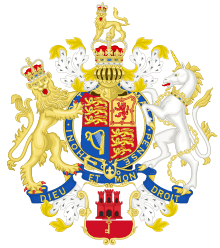 Wikimedia Commons has media related to Coats of arms of King William III and Queen Mary II of Great Britain. King James II is deposed and replaced with his daughter Mary and son-in-law and nephew William. 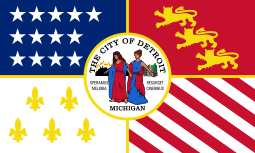 As co-monarchs, they impaled their arms: William bore the Royal Arms with the addition of an escutcheon of Nassau (the royal house to which William belonged): Azure billetty or, a lion rampant of the last armed and langued gules, while Mary bore the Royal Arms undifferenced. Wikimedia Commons has media related to Coats of arms of King William III of Great Britain. After the death of Queen Mary II, King William III reigned alone, and used his arms only. Queen Anne inherited the throne upon the death of King William III, and the Royal Arms returned to the 1603 version. 1714–1801 The 2nd quarter was replaced with a set of arms showing the origins of the House of Hanover as a result of the Act of Settlement. English heraldry flourished as a working art up to around the 17th century, when it assumed a mainly ceremonial role. The Royal Arms of England continued to embody information relating to English history. Although the Acts of Union 1707 placed England within the Kingdom of Great Britain, prompting new, British Royal Arms, the Royal Arms of England has continued to endure as one of the national symbols of England, and has a variety of active uses. For instance, the coats of arms of both The Football Association and the England and Wales Cricket Board have a design featuring three lions passant, based on the historic Royal Arms of England. In 1997 (and again in 2002), the Royal Mint issued a British one pound (£1) coin featuring three lions passant to represent England. To celebrate St George's Day, in 2001, Royal Mail issued first– and second-class postage stamps with the Royal Crest of England (a crowned lion), and the Royal Arms of England (three lions passant) respectively. The boar adopted by Richard III prompted William Collingbourne's quip "The Rat, the Cat, and Lovell the Dog, Rule all England under the Hog",[note 2] and William Shakespeare's derision in Richard III. [note 3] The red dragon, a symbol of the Tudor dynasty, was added upon the accession of the Henry VII. 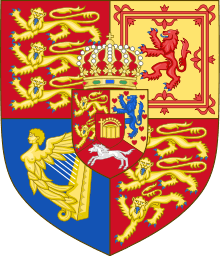 After the Union of the Crowns, the supporters of the arms of the British monarch have remained as the Lion and the Unicorn, representing England and Scotland respectively. 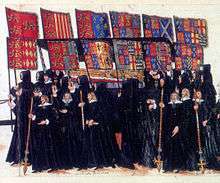 When displayed in war or battle, this banner signalled that the sovereign was present in person. Because the Royal Banner depicted the Royal Arms of England, so its design and composition changed throughout the Middle Ages. 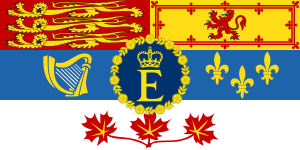 The Queen's Personal Canadian Flag, featuring the Royal Banner of England in the First quarter of the first two divisions. ↑ This was a pun on Richard III (the Hog) and three of his staunchest supporters, Richard Ratcliffe (the Rat), William Catesby (the Cat) and Francis Lovell (the Dog). ↑ For instance, in Act 1, Scene III of Richard III, Margaret, Queen consort of England describes Richard as "Thou elvish-mark'd, abortive, rooting hog!" ↑ Jamieson 1998, pp. 14–15. 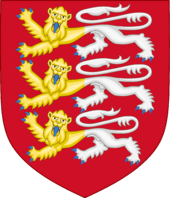 1 2 3 Boutell 1859, p. 373: "The three golden lions upon a ground of red have certainly continued to be the royal and national arms of England." 1 2 3 Fox-Davies 2008, p. 607. 1 2 3 4 5 6 7 8 9 10 11 The First Foot Guards. "Coat of Arms of King George III". footguards.tripod.com. Retrieved 4 February 2010. ↑ Parker, James. "A Glossary of Terms Used in Heraldry". A Glossary of Terms Used in Heraldry. Retrieved 18 September 2015. 1 2 Paston-Bedingfield & Gwynn-Jones 1993, pp. 114–115. 1 2 The Royal Household. "Union Jack". royal.gov.uk. Archived from the original on 30 June 2013. Retrieved 28 August 2009. ↑ The Public Register of Arms, Flags and Badges of Canada. "The Flag of Her Majesty the Queen for personal use in Canada". gg.ca. Retrieved 28 August 2009. 1 2 3 Briggs 1971, pp. 166–167. 1 2 Ingle, Sean (18 July 2002). "Why do England have three lions on their shirts?". guardian.co.uk. Retrieved 15 September 2010. 1 2 3 4 Fox-Davies 1909, p. 474. ↑ Keightley 1834, p. 310. ↑ James 2009, p. 247. 1 2 3 4 5 6 7 Boutell 1859, pp. 373–377. 1 2 Ailes, Adrian (1982). The Origins of The Royal Arms of England. Reading: Graduate Center for Medieval Studies, University of Reading. pp. 52–63. ↑ Ross 2002, p. 56. ↑ Hassler 1980, p. 6. ↑ Brooke-Little, J.P., FSA (1978) . Boutell's Heraldry (Revised ed.). London: Frederick Warne LTD. pp. 205–222. ISBN 0-7232-2096-4. ↑ Ailes. pp. 52–3, 64–74. 1 2 3 4 5 6 7 8 9 Knight 1835, pp. 148–150. ↑ (Spanish) Francisco Olmos, José María de. «Las primeras acuñaciones del príncipe Felipe de España (1554–1556): Soberano de Milán Nápoles e Inglaterra». «The First Coins of Prince Philip of Spain (1554–1556): Sovereign of Milan, Naples and England», pp. 165–166. Documenta & Instrumenta, 3 (2005). Madrid, Universidad Complutense. PP. 155–186. ↑ "England Football Online – The Three Lions". englandfootballonline.com. Retrieved 15 September 2010. 1 2 Royal Mint (2010). "The United Kingdom £1 Coin". royalmint.com. Retrieved 15 September 2010. ↑ "Three lions replace The Queen on stamps". telegraph.co.uk. 6 March 2001. Retrieved 15 September 2010. ↑ Why Do England’s Cricketers Wear the Iconic Crest on Their Chest? Retrieved on 10 September 2012. The Cricket Blog. 1 2 3 4 5 Brooke-Little 1981, pp. 4–8. 1 2 3 4 5 6 Brooke-Little 1981, p. 16. ↑ Brooke-Little 1981, p. 9. ↑ Paston-Bedingfield & Gwynn-Jones 1993, p. 117. ↑ Hall 1853, p. 74. ↑ Woodward 1997, pp. 50–54. 1 2 Faversham Town Council (2010). "Faversham Coat of Arms". The Faversham Website. faversham.org. Retrieved 16 September 2010. 1 2 3 4 5 Scott-Giles 1953, p. 11. 1 2 College of Arms. "The history of the Royal heralds and the College of Arms". 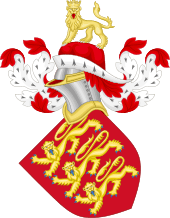 college-of-arms.gov.uk. Retrieved 20 September 2010. ↑ Elston, Laura (8 September 2009). "Herald's tabard". The Independent. independent.co.uk. Retrieved 20 September 2010. ↑ Sumner 2001, p. 9. ↑ "The name and arms of the College". oriel.ox.ac.uk. Archived from the original on 24 June 2009. Retrieved 20 September 2010.